If you want to view already received emails or write messages in Outlook when you are not connected to the Internet, you need to configure Offline Folders. Once you have your folders configured, you can continue to use Outlook in the normal way. You just need to keep it up to date. This is also the procedure that you must go through initially if you want to use the Offline/Online method that is explained on this page. Screenshots from Outlook XP - Similar in earlier versions. Outlook 2003 and higher doesn't actually need this feature, as Cached mode is effectively Offline folders. You can still set it up if you wish (for example you aren't using Cached mode) and the process is very similar to the one outlined below. When connected to the Internet or in the office, start Outlook as normal. When you see the list of groups, "All Accounts" should already be highlighted. Click Edit to change the settings. You will then be presented with your list of folders. To get Outlook to create the offline folders, click on box next to Inbox. After pressing Yes, you will be presented with another box asking you where you want to store the offline folder. In most cases the default location is fine. However if you are running low on disk space you can change the location at this point. If you want to change the location later on, you will need to delete this file and go through this process again. 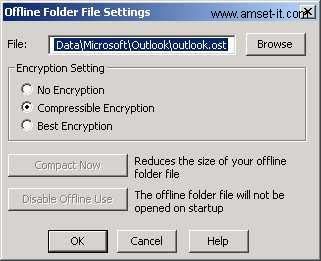 After pressing OK, you will be prompted to create the file.Press Yes to allow Outlook to create the file for you. 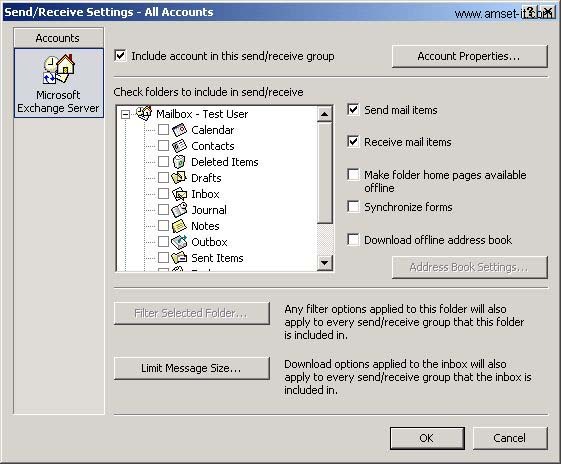 ... you will be returned to the "Send/Receive Settings - All Accounts" dialogue. At this point you can choose which folder's you want to be available offline. 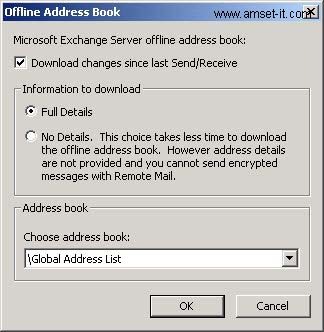 You should also enable "Download offline address book". After enabling "Download offline address book", click on the button "Address Book Settings..." to ensure that you are downloading all the data. The dialogue box should have "Full Details" enabled. We keep the Outlook address book up to date with the phone numbers of staff. BY downloading the full details will ensure that you have these details when offline. After choosing your folders that you want to sync, you can press OK or apply until you return to the main Outlook screen. 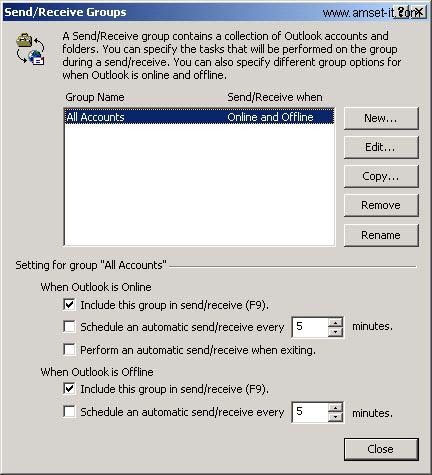 To copy your data you should now press "Send/Receive" which is at the top of your Outlook window. A dialogue box similar to below will appear. Be aware that the first sync might take a little while, depending on how much email you have already. For this reason it is advisable to make this sort of change in the office or on a broadband internet connection. Q: How can I access public folders offline? A: You need to copy the folders to your favourites. Under Public Folders, you will find two folders, "All Public Folders" and "Favourites" Copy the folders you want available offline in to favourites. You will then be able to select it in the folder list as before. Q: How can I check the size of my offline folder? Q: How can I reduce the size of my offline folder? A: If you have lots of email, your offline folder can quite large. To check, search your hard disk for outlook.ost. If you cannot find it, then look for *.ost. Once you have found it you can right click on it and choose properties to check how large it is. To reduce the size of it, there are a number of things that you can do. If you have recently deleted lots of messages, you should compact the file. To get to the place where you can do this, in Outlook click "Tools", "Email Accounts", "View or Change an Existing Account". Ensure that Microsoft Exchange is selected. Click "Change..." then on "More Settings...". Click on the tab "Advanced" then the "Offline Folder File Settings..." button. Click "Compact Now" to run the compacting programme. If you have a number of very large emails that you have received while on the network or have sent but wish to keep, you could create a "large emails" folder while online and not enable it for offline use. If you move all of your large emails to this folder when in the office working online, this will reduce the size of your offline folders. Q: How can I change the location of my offline folders? A: Offline mail is held in a special file with the "ost" extension. This file can be located anywhere on your machine. To change the location, delete the existing one and go through the process on the "Configuring Offline Folders" page again. Q: How can I keep my offline folders up to date - even when working online? A: In the Offline Folders group configuration (screenshot) you can enable an option to do a send/receive automatically even when online. If you enable this option Outlook should keep itself up to date. Q: I am accessing data that has been shared to me by another user, will that be available offline? A: This functionality was introduced with Outlook 2007. 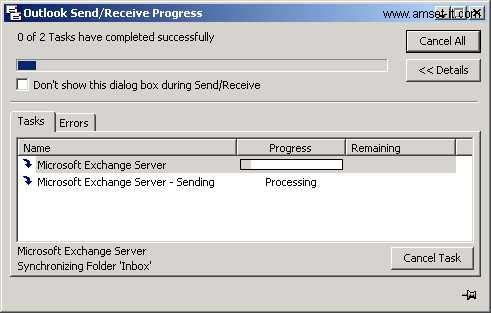 With versions of Outlook prior to 2007 it is not possible.